Hello! Merry Christmas! I'm Kindra from At Home With K and I am so happy to be a part of Haul Out The Holly! Thank you so much Gwen for having me take over your blog for the day! 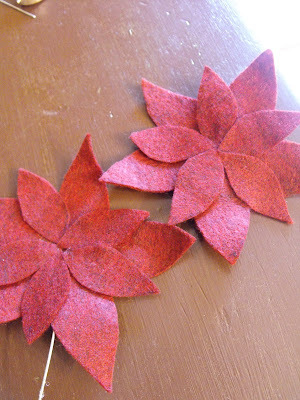 Today I am going to show you how to make Felt Poinsettias. What I love about this project is that it is CHEAP!! Felt can be bought at your local craft store for super CHEAP! An 8''x11'' piece of felt is 25 cents each at Hobby Lobby. And I just happened to be there during their sale, so it was 1/2 off! So I actually got it for 13 cents each! 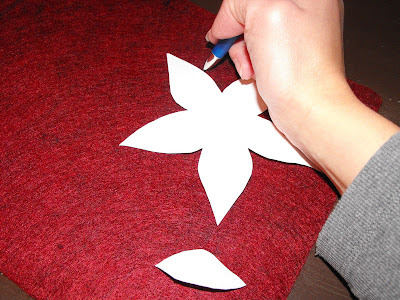 Take your felt and use the pattern that I provided below and trace away with a pen. 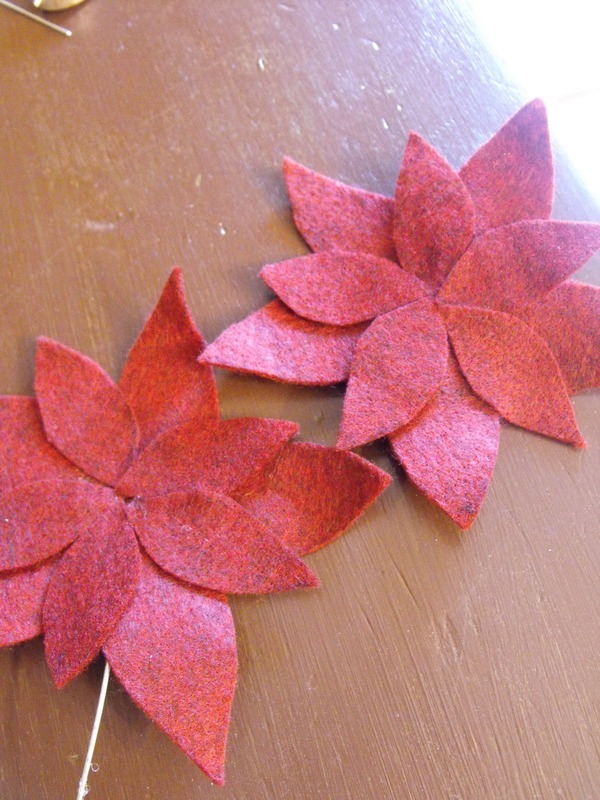 If my calculations are right you can make about 4 poinsettias to one sheet! 1 "flower pattern" and 5 "petal patterns" equals 1 poinsettia. 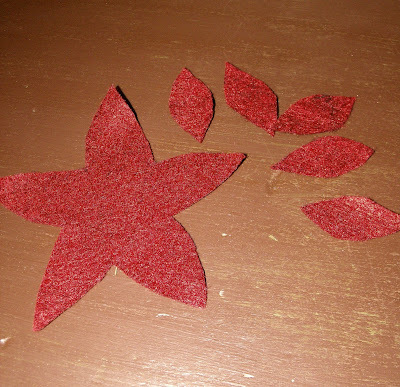 If you are making several poinsettias at a time, put in a good movie and cut away. Cut your wire 2-3 inches in length with wire cutters. I used floral wire that I got at my local craft store. Find the center of the flower and poke right through the felt. 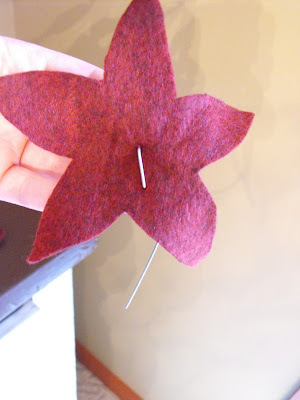 Then bend it about 1/2 inch against the felt so it will stay put. I then glued the wire to the felt to secure it. It is up to you what kind of glue you would like. 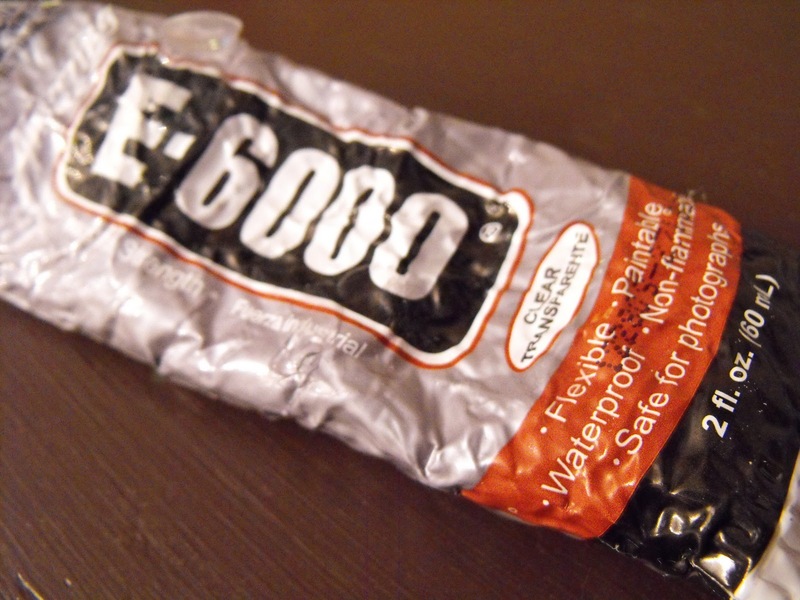 E-6000 is my new favorite! It's flexible so it works great with felt! You then glue on your petals. Make sure one of the petals is covering up the bent wire. It is now time for the bells! 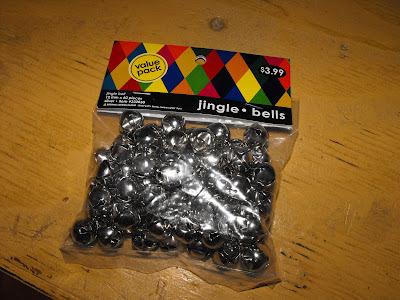 I got a sack of small bells (approx. 60) for $4. They were then 50% off at Hobby Lobby. $2 baby! The value pack of bells comes in silver and gold. 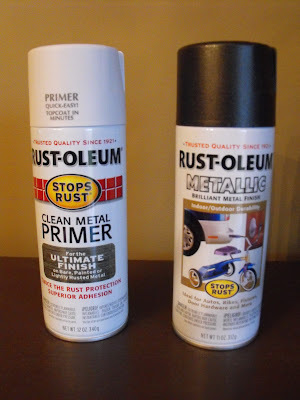 You can leave as is but I'm not a fan of either so I pulled out the spray paint! I used a metal primer and a metallic bronze spray paint. 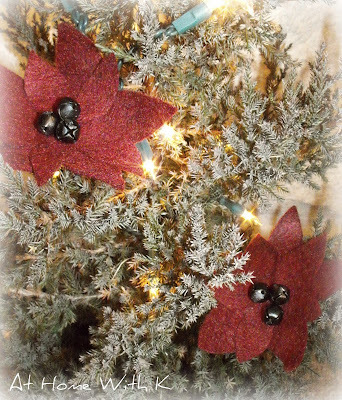 After the bells were dry, I took a needle and thread and sewed on my bells to the center. Use 3. And Finished! Like I said, so easy! You can put them in your tree. I made 20 of them, so they will be going on our BIG tree this Christmas! 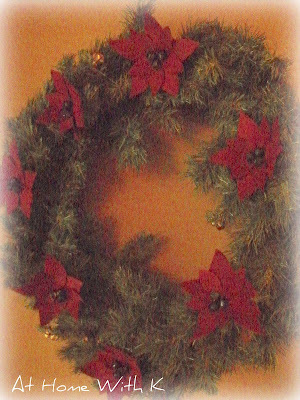 Or add to a wreath...or any kind of greenery in your home. Or how about attaching longer length wire to your poinsettias and it would be a wonderful flower arrangement with greenery in a nice vase. 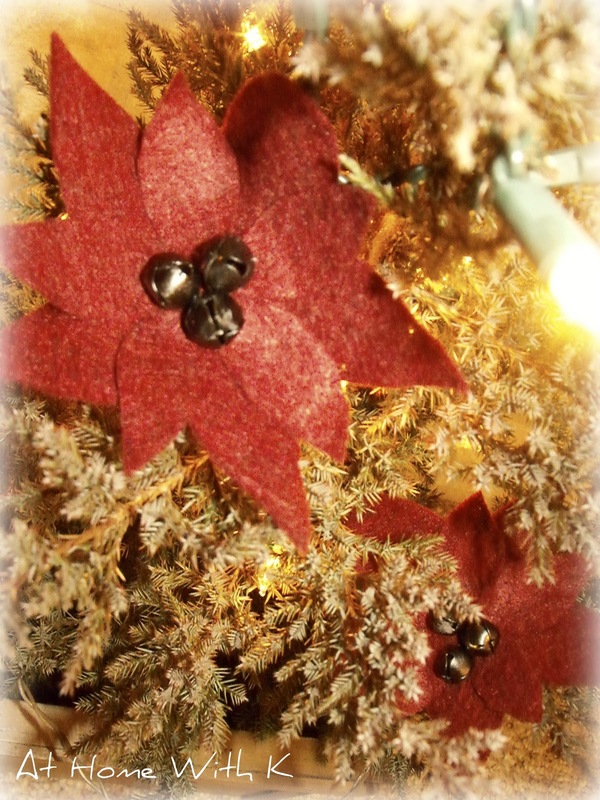 I hope I inspired you to do a little crafting this Holiday Season! Thanks again, Gwen, for having me!! These are beautiful, Kindra! I love the bronze jingle bells in the center. Gotta love a quick and easy craft that looks like a million bucks! 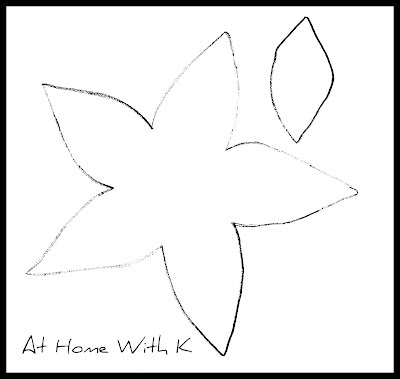 Please stop over and check out Kindra's fantastic blog At Home With K. She has impeccable taste in home decorating. She is super talented with a can of paint and an old piece of furniture, too (among many, many other talents). 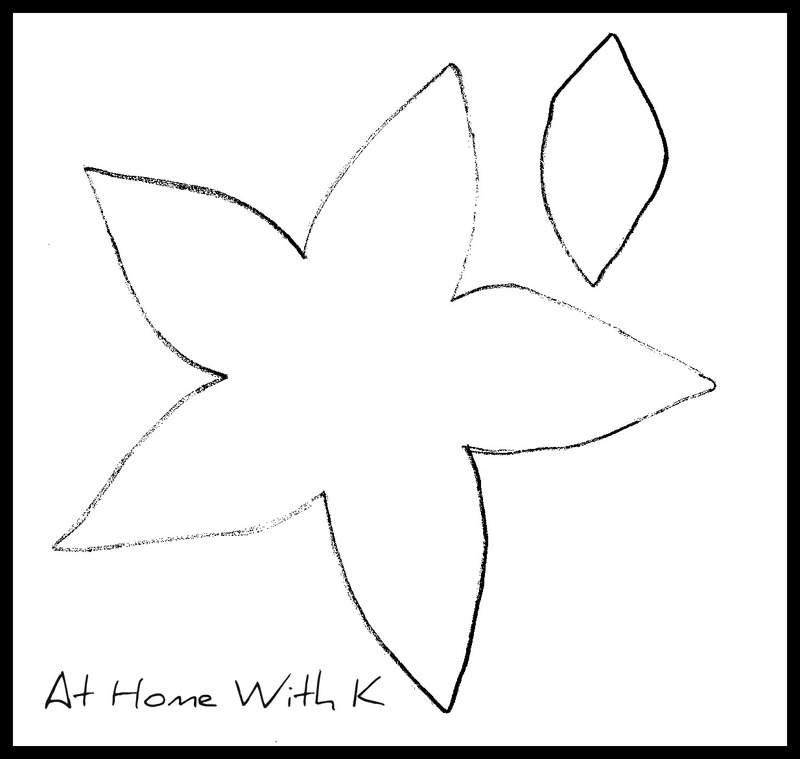 I found Kindra's blog when I saw her State of the Art, and I've been hooked ever since. Thanks, Kindra, for sharing your felt poinsettia tutorial today! Thanks so much for having me, Gwen! I have been enjoying the other bloggers' tutorials as well!! Can't wait to see what's next! Very pretty, Kindra! 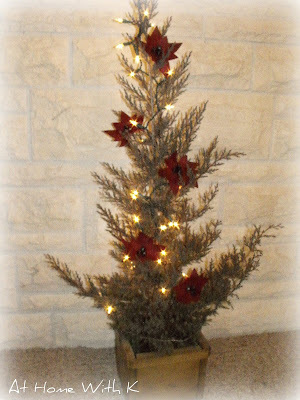 I love a low cost project that looks great! Thanks for sharing with us, yet again, one of your great projects! What a perfect holiday touch! I love the bells in the center. I love this! So vintage looking. I am a felt nut! Thanks for sharing your pattern. I can't wait to get started. Wow, those are gorgeous! I love the vintage feel. The jingle bells are the perfect touch! These are lovely. I agree! These are fantastic! 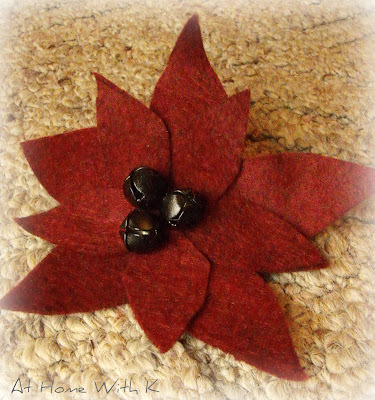 These would make very festive brooches. Love making whole sets of ornaments like these - great idea! Hi! Thanks so much for sharing! I linked to this post on my blog and wanted to let you know. If you have a chance, drop on by!